All of our pies are 10” deep dish and serve 8-10. We make 100% butter crusts (no oil) and prepare all our own fillings from whole fruits and berries. 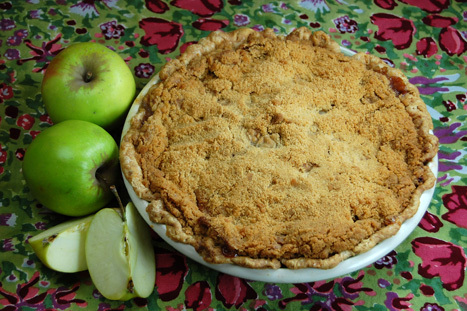 Apple Crumble Pie—crisp, fresh apples from Detering orchards in Harrisburg mixed with cinnamon and brown sugar and topped with a buttery streusel topping. Marionberry Pie—sweet Oregon marionberries prepared with a rich, lattice topped crust. Mocha Buttercrunch Pie—A buttery, chocolate mocha filling in a crust of chopped roasted walnuts and semi-sweet chocolate chunks. This original Metropol recipe was featured in Bon Appetite Magazine. 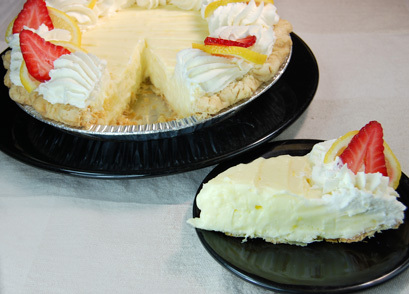 Lemon Sourcream Pie—Fresh, homemade lemon curd mixed with whipped sour cream, fresh cream and lemon zest. Garnished with whipped cream and fresh lemon slices. Tarts are individual servings and made with classic, all butter Pâte Brisée crust. Lemon Meringue—lemon curd filling made with fresh juice and zest. Spiky, classic meringue tops tart. Banana Cream—rich, French crème patissiere flavored with banana liqueur and fresh bananas. Topped with whipped cream and fresh banana dipped in semi-sweet chocolate. Chocolate—classic French chocolate Parisienne crème filling topped with vanilla whipped cream and semi-sweet chocolate swirl. Crust is dipped in dark chocolate. French Strawberry—sweetened cream cheese filling generously topped with fresh strawberries in our own strawberry glaze. Vanilla whipped cream and strawberry garnish. French Blueberry—sweetened cream cheese filling mounded with fresh blueberries in glaze topped with vanilla whipped cream and blueberry garnish. Rhubarb—cream filling with a tangy, fresh rhubarb compote. Vanilla whipped cream completes this seasonal tart. Key Lime—graham cracker and butter crust with a zippy, hand-juiced fresh lime chiffon filling. Vanilla whipped cream topping on this seasonal treat.